Happy 100, Manitoban (that's us)! 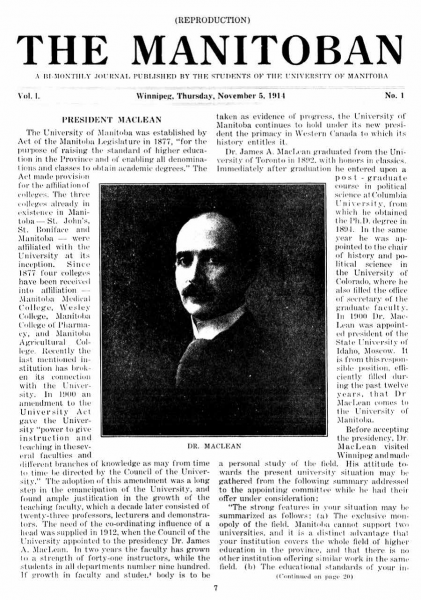 The Manitoban celebrates its centenary Wednesday, Nov. 5 – 100 years and counting covering issues that affect University of Manitoba students most. To mark the special day, members of the Manitoban’s design team have selected 10 pieces of cover art from issues dating back to the paper’s inaugural issue for this week’s centrefold. Flip the page for a look at some of our favourites. These covers will be featured in the Starving Artist Gallery in Degrees for the month of November. The paper is the strong institution it is today because of the funding it has received from hundreds of thousands of students. The same acknowledgment extends to the efforts of the people who have managed the business of running a paper and populating its pages with engaging, important content for all these years. The majority of the paper’s staff have been busy students, many of whom took on declines in their GPA in the name of covering U of M news of the day. And Manitoban readers are better for it. A lot of interesting things have happened in all that time – to the paper and campus. Many influential journalists made their first forays into the writing world in the pages of the Manitoban, often tasked with covering past incarnations of the same issues facing students today. Graham Spry was an editor-in-chief at the paper in the early 20s. He would’ve been at the helm for student elections, faculty association changes, tuition fee changes, student union controversies, etc. Later on, in the 30s, he had a huge hand in creating a modest little independent outfit known as the Canadian Broadcast Corporation (CBC). Andrew Coyne, a writer with the National Post, guest panellist on CBC’s The National, and one of Canada’s foremost political commentators, got his start as an editor at the Manitoban. The focus of his writing these days relates mostly to economics and federal politics. In the early 80s, however, Coyne was covering perennial campus issues, like UMSU presidential elections and proposed U of M tuition fee increases. Nahlah Ayed, an editor at the paper in the mid-90s and a former U of M Graduate Students’ Association president, is currently one of the CBC’s most notable foreign correspondents and received an honourary doctorate of law by the U of M in 2007 for her coverage of issues in the Middle East. Ayed now covers geopolitical issues playing out on the international stage. But one of the last times her name appeared in the paper in the 90s saw her responding, in her capacity as a U of M Graduate Students’ Association councillor in an interview with a Manitoban staff member, to the paper seeking autonomy from UMSU. “The Toban can push more limits within a certain parameter if they know that there isn’t this hold over them that they may possibly be shut down,” noted Ayed in the April 6, 1994 issue of the Manitoban. Along with annual advertising revenue, funding for the paper comes directly from students in the form of an annual levy that is included in tuition. It has always been thus. But the student union used to have ultimate control over the budget and hiring of staff. Understandably, this made our Toban ancestors very nervous. 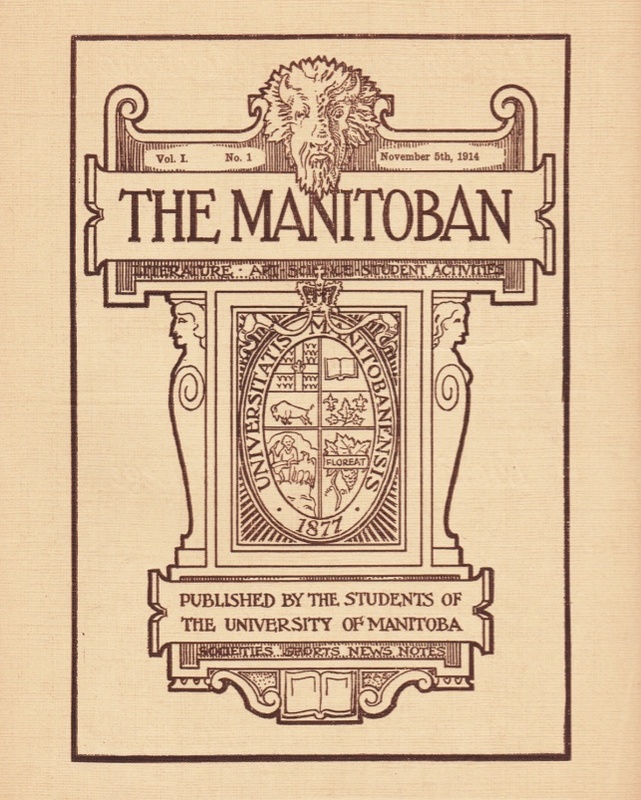 Until the Manitoban achieved its desired autonomy from UMSU, there was always a possibility that the current executive could (and did, on more than one occasion) attempt to interfere and exercise an amount of control over the direction or content of the paper. Although it hasn’t happened recently, there have been attempts to shut the paper down, to block bids to increase its funding, to force it to issue retractions. But it’s still standing, because it’s the students who decide whether the direction the paper is going is acceptable, and Ayed’s prescient words issued in the lead-up to a referendum on the topic of the paper’s independence still ring true more than 20 years on. Again, not much has changed: the students remain the paper’s primary constituents, its primary concern. The Manitoban remains the only training ground of its kind on campus where students can develop hands-on journalistic experience while also keeping their peers up to speed on what’s going on. The paper’s future will no doubt be as engrossing as the cover art in this week’s centrefold, as unpredictable as its past. Whatever happens, if you’ll have us, we’ll still be here – recorders and laptops at the ready. 2 Comments on "Celebrating a century of service"
Congratulations on 100 years of telling truth to power (plus lots of other things worth reading). All I really needed to know I learned writing for The Manitoban. Congratulations on your 100th anniversary. Like an earlier commenter, David Sanders, much of what I learned about journalism I learned at The Manitoban. I have fond memories of long nights stretching into early mornings as we put the paper together in our office on the third floor of the old UMSU building. In addition to journalistic skills, many life-long friendships were forged there. I was editor of The Manitoban in 1968, and a former vice president of Canadian University Press.